After seeing cute Dragon Quest Slime and Hatsune Miku meat buns, it was only a matter of time before Hello Kitty hit Japanese convenience stores. For a limited time only, convenience store chain Sunkus is selling Kitty-chan meat buns for ¥150 ($1.90) a pop. Japanese site Gigazine ordered a few and took photos for the internet's viewing pleasure. 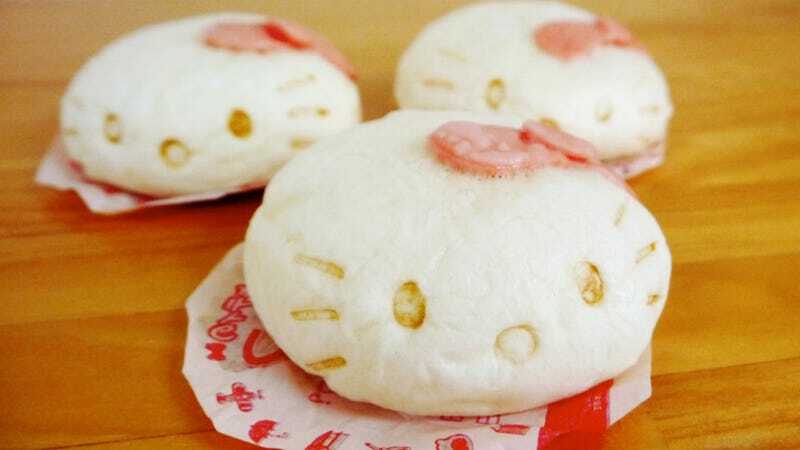 Here's what the Hello Kitty meat bun looks like. So cute! From what Gigazine wrote, it sounds as though the Hello Kitty meat buns taste like yummy pork meat buns. Though, it's only a matter of time before people begin torturing them. There's even a Kitty quiz on the bottom of the paper atop which the buns sit. Here it asks when Kitty's birthday is: April 1, July 1, November 1, or December 1. Do you happen to know?